Are saunas good for you? Sweating is an impulse that goes far back in human history. About 3,000 years ago, the Mayans of Central America used sweat houses for religious ceremonies and good health. Nearly every culture has its own way of using heat for relaxation, therapy and ritual; ancient Roman baths, modern Turkish steam baths, and trendy American hot tubs are but a few examples. One of the oldest — and hottest — of these techniques is the sauna. Saunas have been used for thousands of years in Finland, where nearly a third of all adults take them regularly. And saunas are increasingly popular in the United States, where over one million are in use. Popularity is one thing, safety is another. 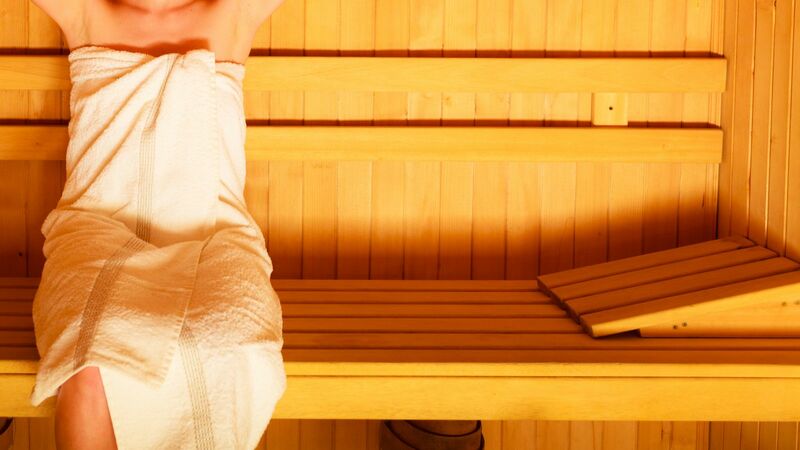 Are saunas good for your health, or can they be harmful? The modern sauna is a simple unpainted room with wooden walls and benches. A rock-filled electric heater keeps the temperature at about 90° at floor level and boosts it to about 185° at the top. Unlike Turkish baths, Finnish saunas are very dry. Humidity levels are just 10% to 20%. Water drains through the floor to keep things dry. In a good sauna, an efficient ventilation system exchanges the air 3 to 8 times an hour. The dry heat has profound effects on the body. Sweating begins almost immediately. The average person will lose a pint of sweat during a brief sauna. However, it evaporates so quickly in the dry air that a person may not realize how much he is perspiring. Skin temperature soars to about 104° within minutes, but internal body temperature rises more slowly. It usually stays below 100°. Changes in body temperature are easy to understand, but the heart's responses to heat are even more important. The pulse rate jumps by 30% or more. As a result, the heart nearly doubles the amount of blood it pumps each minute. Most of the extra blood flow is directed to the skin; in fact, the circulation actually directs blood away from the internal organs. Blood pressure may rise or fall. All of these changes resolve quickly after a person cools down. Much of the information about sauna safety comes from Finland. A 16-month study of 1,631 heart attacks in Helsinki found that just 1.8% developed within 3 hours of taking a sauna. In another investigation of all 6,175 sudden deaths that occurred in one year, only 1.7% occurred within 24 hours of taking a sauna — and many of those were related to alcohol. In Finland, taking saunas is a national pastime. So, do these results apply to people in other parts of the world who sometimes use saunas? Canadian researchers investigated sauna safety in 16 patients with well-documented heart disease. They compared the effects of a 15-minute sauna with a standard treadmill stress test. None of the patients developed chest pain, abnormal heart rhythms or ECG changes with either type of stress. Heart scans did show impaired blood flow to the heart muscles of most patients, but the sauna-induced changes were milder than the exercise-induced abnormalities. Saunas appear safe for patients with stable coronary artery disease. A small study from Japan suggested that two weeks of daily saunas may even improve vascular function in patients with mildly damaged hearts that cannot pump blood normally (stable heart failure). Still, heart patients should check with their doctors before using saunas. People who can perform moderate exercise, such as walking for 30 minutes or climbing 3 or 4 flights of stairs without stopping, will likely get an okay. But patients with poorly controlled blood pressure, abnormal heart rhythms, unstable angina and advanced heart failure or heart valve disease will be advised to stay cool. Although saunas affect many parts of the body, most changes are brief and mild. For example, elevated scrotal temperatures reduce sperm production, but there is no evidence that regular saunas impair fertility. Hot tub temperatures average between 100° and 104° F. If saunas are safe, hot tubs should be, too. Indeed, a study of 15 men with stable coronary artery disease showed that 15 minutes in a hot tub produced less circulatory stress than 15 minutes on a stationary bike. In addition, a study of 21 people with hypertension found that while sitting in a hot tub lowered the blood pressure, it never approached unsafe levels. To enjoy a hot tub safely, follow the same guidelines as for saunas. And be sure the tub is clean and well chlorinated to avoid folliculitis, a skin infection that can result from poorly maintained hot tubs. A few simple precautions to have sauna safety are important for healthy people and heart patients alike. Don't overdo it; 15 to 20 minutes of a sauna is a reasonable time limit for most folks. Don't take a sauna when you are ill, and if you feel unwell during your sauna, head for the door. A cool head is the best way to keep your hot sauna safe and enjoyable.